According to him, "we have decided to suspend our two month old strike; this decision was taken at the end of our National Executive Council (NEC) meeting. "We shall not hesitate to resume the suspended strike should government fail to review the Memorandum of Action (MoA) and ensure full implementation before end of May 2019. "This is in view of the progress made in the course of the union's negotiations with government. "The NEC of the union, after exhaustive deliberations and in due consultations with the respective congresses across the nation resolved to suspend the current industrial action. "This is based on the condition that government committed to review the Memorandum of Action to concretise the resolutions and ensure its full implementation by end of May 2019, failing which the union shall resume the action at its discretion." He said government has equally made a public pronouncement on the issue conveying the government's approval for the release of the sum as requested. "It is expected that the funds shall be made available for disbursement to deserving institutions by April 2019. "Equally, the approval of the NEEDS assessment report shall be pursued with all diligence to ensure a sustained and effective intervention in the infrastructure and other needs of our institutions," he added. 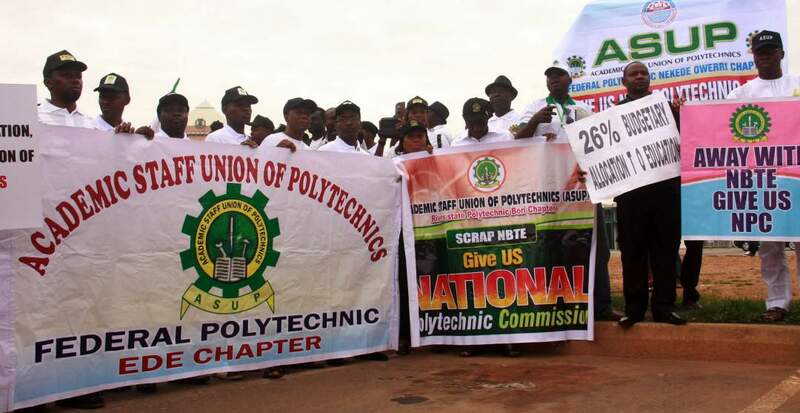 "A circular had also been released to all Rectors conveying increased personnel funding for 2019 and directing the payment of full salaries and allowances in Polytechnics. "A schedule from the office of the Federal Ministry of Finance containing institutions contained in the phase one of the shortfall refund payments has been released. "Our union notes that 11 institutions from the sector are cleared to receive funds from the approved tranche. Our union has been reassured that the next phase will contain more institutions. "The government reported moves to review the instruments for accreditation to include such requirements. The union was informed that NBTE had been directed to cease further regulatory activities in such institutions. "Document conveying the implementation of this resolution has been released vide letter ref: C/TEB.97/Vol.II/512 of 4th February, 2019 from the NBTE conveying a review of the guidelines for programme accreditation to include the issue of regular payment of salaries and allowances in institutions," he said.